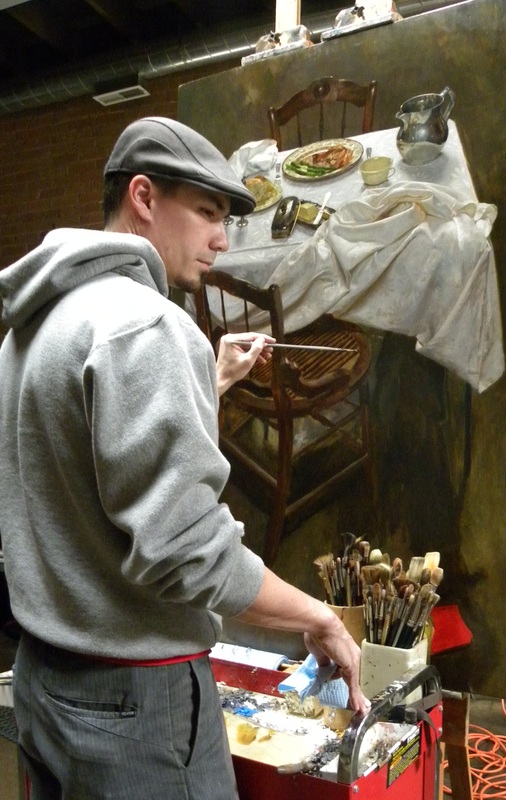 Jeff Hein was working on this magnificent painting in progress today of a table setting with two chairs and one plate setting.I asked for it seemed that he was working in the dark to me, as the only light he was using was the sky light overhead, and it being a somewhat cloudy snowy day outside. He replied that with this painting he was using only natural light. He was working on the caning in the seat of one of the chairs. Jeff’s daughter during that session was drawing her father and she would come up close to check out the structure of his ear, then race back to draw what she saw. Note to the collectors out there, watch her in the future, she has the eye of a great artist. Great artist in the making. This entry was posted in Process and tagged drawing from life, Fine art, Hein Academy of Art, jeff hein, oil painting, painting, reference drawings, still life, Utah Art. Bookmark the permalink. can only imagine her work in the future! In particular enjoyed the detail photo of Jeff’s painting in progress. I’d like to know why Jeff did not have one of the girls looking up at Christ’s face. Who are they looking at? I chose to have to girls looking at the viewer in order to give the viewer the sense that they are part of the story. They are the strangers, part of the scary world, while christ is familiar and a source of safety and comfort to the girls. I compare the relationship of the girls to Christ to that of a mother and young child. In the presence of stangers the child would likely look out to the stangers while holding tight to their mothers leg. It is also a metaphor fo all of us who find strength in Christ as we look out into the difficult and sometimes scary world. Tell Ady that I think she’s doing a great job. I just noticed that her hands are just like her father’s. 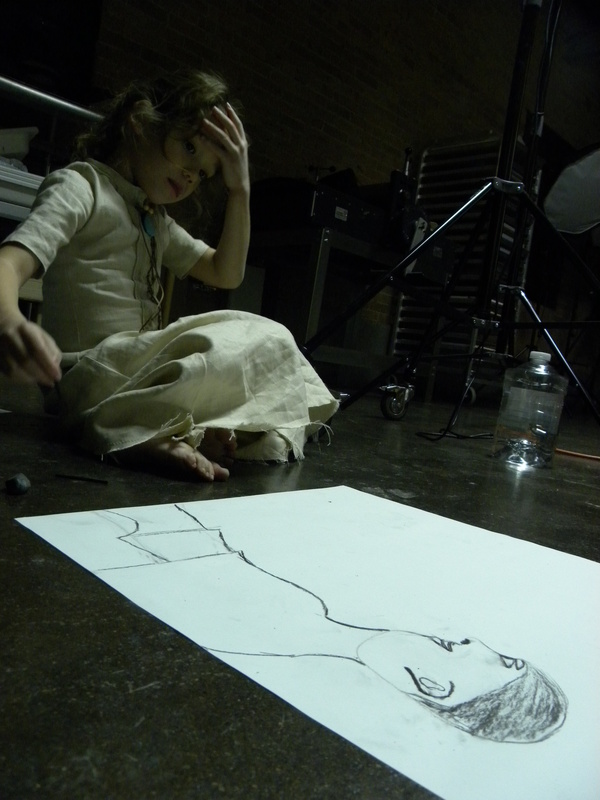 She’s a beutiful little girl and this particular shot of her shows the intense thought that she is putting into her sketch (just like her dad does). Like father like daughter indeed. A very nice photo of his daughter, I wonder what’s going on in her mind.